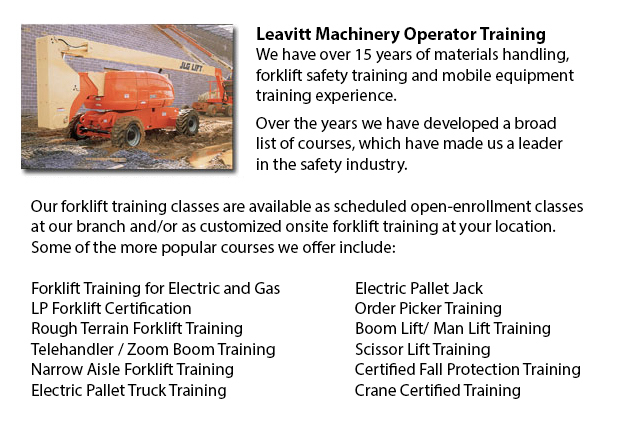 Edmonton Manlift Training - Different manlift training programs consist of the content and review of manlift devices. An important part of the program is the practicum where students demonstrate their knowledge and practical ability to safely operate a manlift. A prerequisite to Manlift training is the fall protection training, that could be incorporated in the training based on the specific requirements of the customer. The program consists of the following areas of instruction: pre-shift machine inspection and work area survey requirements; the impact of doing unsafe acts or operating unsafe machinery, Review of load capacities, Lifting devise equipment definitions, safety decals and specific equipment requirements, Review of related sections of the OSHA Standards as well as the CSA Standards and Review site particular Dangers, along with controls for safe utilization of a lifting device. Each individual will be tested to make sure they can safely and efficiently use your site-specific equipment. As the manlift is capable of lifting personnel and materials more than 20 feet in the air, these machinery pose a particular amount of danger and could be dangerous equipment if not utilized properly. As the danger is so apparent, lift owners and operators are careful to properly maintain their machinery and follow correct safety measures and operating procedures. The ratio of accidents involving this specific equipment is fairly low. The safe use of the scissor lift, manlift and the boom lift is up to the operator of that machine. They need to understand all of the responsibilities that go with running the equipment and how to operate the lift vehicle safely. The most basic safety features on the machinery are safety decals and the operating manual. These show essential information about the maintenance, operating procedures and safety machinery. A new model of manlift will come together with the required decals in place and operating guidebooks. The operating manual must be found on the machine at all times. If you are purchasing a used lift, it is important to make sure that the guidebook is included and that important decals haven't been painted over. The restraints which prevent operators from falling and the guardrails are other vital safety features. These are mandatory and standard on all kinds of lifts.